Access to a class coordinator and regional coach who is available to talk to you at any time during your weight loss journey. How to eat regular foods and lose weight fast. How to overcome emotional eating. How to transfer a relationship with food over to a relationship with God. Class videos can be viewed on both Windows PC and Mac computers (via Adobe Flash) as well as on all Internet-accessible Mobile Devices (a WiFi connection is recommended for the best viewing experience) and through the Weigh Down APP for Apple or Android devices. You will need to provide your own Bible. This class uses the NIV 1984 Bible. How does this class work? 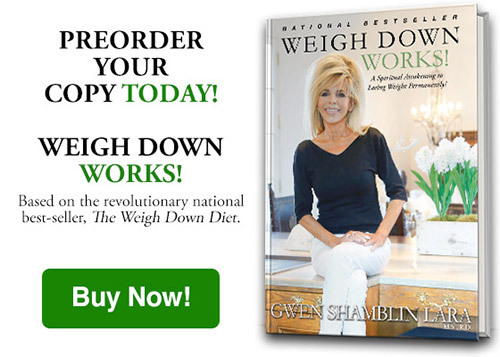 Once you have purchased Weigh Down Basics, you will see a NEW Button at the top of the Store that says "Basics Class" - simply click on that button to get started losing weight right away! If you do not see the "Basics Class" button at the top of the store navigation menu, just click Login. After logging back into the store, you should see the button appear. You will also receive an email with a link that will take you straight to the class log in page. We look forward to getting to know you, and if you have any questions, please let us know. Your workbook and truthcards will arrive within 5-7 business days. CLICK HERE to sign up for Weigh Down Basics Online and start your class today!